Most home bakers start off their business as a hobby. For your business to stand out, however, you must create a product that people will remember. The idea for this unique product began after the actress’s marriage to professional basketball player Jimmy Alapag in the United States in August 2010. It was there where she got her first taste of the cake pops. She enjoyed them so much but couldn’t find them when she came back home to the Philippines. She then decided to come up with her own recipe, and started giving them as Christmas gifts that same year. This led to orders, and soon, news about her cake pops spread. Alapag admits that competition has surfaced since word got out about The Lollicake Factory, but she takes this as an opportunity to improve her products, and offer services that others don’t. 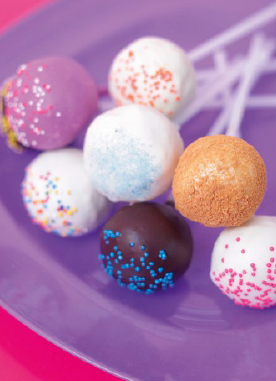 For now, her minimum order for customized cake pops is only one dozen. Her bestselling flavors are Red Velvet, Cheesecake and Chocolate. “We also have edible printing on our Lollicakes, so if you want your company logo or even a photo of you and your hubby as a wedding giveaway, we can do that for you,” says Alapag. “Smaller than a cupcake, chewier than a brownie, has more kick than a rum cake” is how Joana Lim describes her drunken confections made with premium, imported alcohol, and dipped in chocolate or candy colored sugar bits. 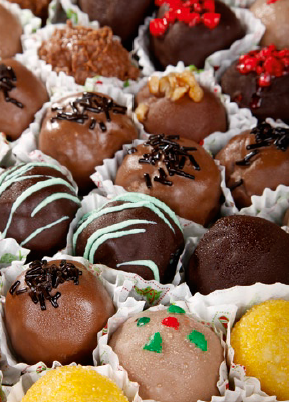 The concept behind Lim’s Liqueur Bonbons was sparked when her brother brought home rum balls from a trip abroad. She loved the idea so much so she developed her recipe of “classic Bacardi bons” to give as gifts. “My close friends gave me the idea of taking it to the next level since there’s nothing like it yet in the market today,” says Lim. In November 2010, Lim decided to try out bazaars to generate interest for her product. By joining these events, Lim has been able to land orders not only from individuals, but also from companies giving the bonbons as giveaways. To satisfy varying tastes of the market, Lim has formulated more alcohol and chocolate combinations, and more flavor varieties. Her bestsellers include Absolut Blackforest, Absolut Chocomint, Coffee Kahlua, Amaretto and Walnut, and Oreo Cheese Bons. Liqueur Bonbons now carries over 20 flavors with four varying bonbon “intensities” from Wasted, Drunk, Tipsy to Sober. Lim also offers customized flavors using the client’s favorite liqueur for bulk orders for weddings, debuts, parties, and other events, making her product much more unique and personal.